ESP is an intensive exercise designed to quickly identify the key capabilities an organisation needs to develop to achieve its goals. It can be completed in as little as 10 to 15 working days and provides an essential foundation for an ongoing programme of continuous improvement. Capture and prioritise the business strategies which differentiate you from your competition. Clarify and prioritise the relevant business initiatives (internally facing projects) that are needed to support the business strategies. Clarify and prioritise the relevant Core Competencies (process, technology, and human factor -related) that are needed to deliver the objectives of high-priority business initiatives. Provide initial recommendations for actions to develop the Core Competencies which need improvement and which will enable you to realise your goals. 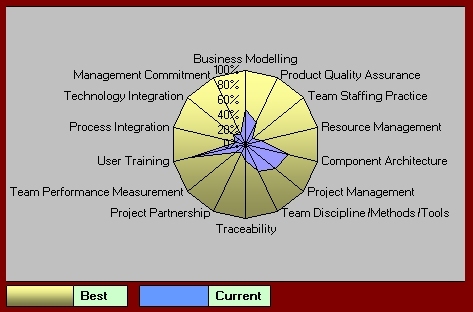 ESP comprises a series of meetings and workshops during which a business matrix is progressively developed (click here for a sample in a new window) and highest priority actions are indentified. We take input from many different areas and at many different levels, using software tools to automate the process and produce results in real time. Although typically targeted at an enterprise as a whole, the method can also be applied at organisation unit level (division, department, location etc. ).